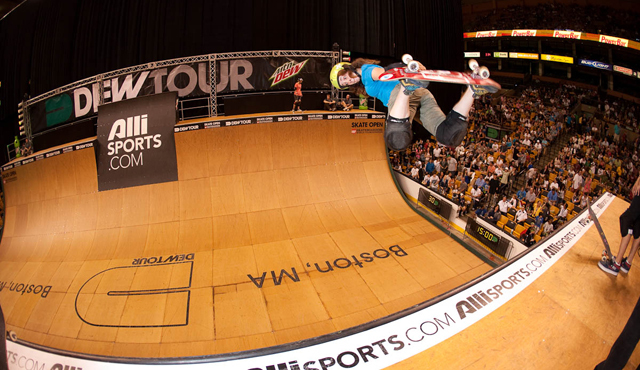 The International Skateboarding Federation held their World Championships Saturday at Boston’s TD Garden. In the women’s field, East Coaster Gaby Ponce won the vert and Brazilian Leticia Bufoni took home the park title. As a relative newcomer on the pro vert scene, 18-year-old Ponce unseated reigning champ Lyn-Z Adams Hawkins to take the win and become the 2010 women’s ISF World Champion for vert. And she could hardly believe the outcome herself. But it was her solid tricks that got her the win, including a kickflip indy, a gay twist and a lez twist. She improved upon her second-place finish at last year’s event to take the win this year. On the park side, Bufoni, 17, is a relative newcomer as well, who moved to California from Brazil a few years ago to pursue her pro career. The difference in parks and contests in the U.S. is something that really stands out to her. Lacey Baker was second and Alexis Sablone was third. Bufoni won the event with solid tech tricks, including a crooked grind on the picnic table, 180 ollie on the big stairs, back Smith grind on the rail, nose blunt slide, and an overcrook.